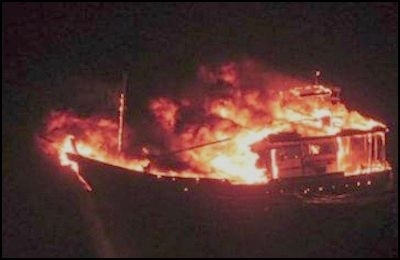 The crew of a Pakistani vessel suspected of carrying terrorists set the ship ablaze after being intercepted by the Indian coast guard. During the holiday season, while North American media obsessed over North Korea's alleged hacking of Sony Corporation and dressed it up as a major international incident, a far more serious confrontation between two other nuclear powers escaped their attention. While sanctions on North Korea grabbed headlines, few of us were aware of the rising tensions between India and Pakistan that could have far-reaching consequences for us in the West. On New Year's Eve, as people partied around the globe, a naval incident was unfolding in the Arabian Sea, some 365 km off the Indian city of Porbander. India's defence ministry would later disclose in a statement that its coast guard ships and aircraft had intercepted a "suspect" Pakistani fishing boat after Indian intelligence tracked the vessel as it left port near Karachi. Fishing boats that cross into the other country's waters are regularly impounded by both India and Pakistan, but this boat was hundreds of miles into international waters when the Indians started giving chase. Instead of stopping and allowing the Indian Coast Guard officials to board the boat, the Pakistani vessel tried to escape. This resulted in an hour-long chase that reportedly only ended when the four "fishermen" set their vessel on fire before blowing themselves up. The Indian Coast Guard released a video of the boat exploding in a huge ball of fire. "I can assure you that those on the boat were not smugglers. The boat was blown up and only people who are motivated and trained could commit suicide." India's Defence Minister Manohar Parrikar claimed the boat was carrying "suspected terrorists" who were "in touch with the Pakistan Army and the Pakistani establishment." After the Indian Express newspaper and the opposition Congress suggested the men on the boat were smugglers, not terrorists, Parrikar asserted: "I can assure you that those on the boat were not smugglers. The boat was blown up and only people who are motivated and trained could commit suicide." For its part, Pakistan strongly rejected Indian allegations the boat was on a terror mission, calling the charges "baseless and preposterous". A Foreign Office spokesperson in Islamabad repeated the now familiar Pakistan refrain that, "Pakistan is opposed to terrorism in all forms and manifestation and has been the biggest victim of terrorism." The alleged "terror boat" journey was eerily similar to one undertaken by another group of Pakistani terrorists in their 2008 attack on Mumbai. Seen in the context of Pakistan blaming India for the recent Taliban massacre of students at an army school in Peshawar, could the boat have been part of a reprisal terror attack gone bad? On Feb. 21 last year, the former head of India's Intelligence Bureau, who has now taken over as Prime Minister Narendra Modi's national security adviser, uttered a sentence at a speech on India-Pakistan relations that may indicate the seriousness of the current crisis. Ajit Kumar Doval told an audience at a lecture on the "Strategic Response to Terrorism" at an Indian university: "You can do one (more) Mumbai; you may lose Balochistan." Balochistan is Pakistan's largest province where there is a guerrilla war for independence from Islamabad. It sits at the mouth of the Straits of Hormuz from where much of the world's oil supplies are exported. If Doval is right, the next war between India and Pakistan will be fought over Balochistan and may involve Islamabad authorizing the "first use" of tactical nuclear weapons. The Porbander boat incident may very well become the Gulf of Tonkin incident that more than 50 years ago triggered the Vietnam war.